6th Class are currently doing buddy reading with Mrs. McDonald's Senior Infants. 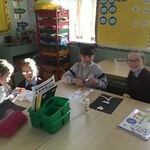 The classes do it every Thursday morning with the 6th class girls helping the younger girls with their reader, new words and their fun book. Ms.Kenny's class have learned how to ask the girls questions based on their sounds, spellings and the pictures in the book. Everyone is enjoying it so much! The 6th class girls even helped the S.Infants with their Halloween skeletons before mid-term break! Both classes involved look forward to continuing it after mid-term break!